AerCap Holdings N.V. (NYSE:AER) is one of the largest aircraft leasing companies in the world, engaging in the leasing, financing, sale, and management of commercial aircraft and engines. It has a market cap of $9.2 billion, and employs over 300 people. AerCap is a remarkably rare stock from a quantitative perspective. It shows strength in every factor that quantitative researchers and academics have found to have predictive value. It combines a cheap valuation, with strong price performance, profitability, earnings momentum, and ‘smart money’ sentiment. Our models have identified AerCap as one of the most attractive investment opportunities in the entire market. Investors would be wise to heed the lessons from history. Expect AerCap to strongly outperform the overall stock market over the next 12 months. We’ll remind investors that we are quants who sift through academic papers and historical data to find repeatable patterns that can be exploited for profit. We’ve distilled our insights into an equity-pricing model that seeks to use historical back testing to generate 12-month price targets that are more accurate than the Wall Street consensus. It’s clear that history favors AerCap’s position right now, as the market has consistently rewarded investors of cheap stocks with significant alpha. This is because cheap stocks are either embarrassing to hold or are part of boring industries with little “excitement”. AerCap fits into the latter category, as the aircraft leasing industry tends to fly under the radar as a relatively niche industry. Over time, this value inefficiency corrects itself and cheap stocks outperform. Our algorithms rank AerCap’s value profile in the 93rd percentile of all stocks in the market (i.e cheaper than 93% of stocks). Our algorithms expect its relative value profile to contribute 5.97% of alpha moving forward. This means that, holding everything else equal to zero, we would expect AerCap to outperform the market by 5.97% over next twelve months just based on its extremely cheap valuation. AerCap has started to get the attention of market participants, gaining 12.1% in price over the last six months (versus a gain of 1.5% for the average stock). The company continues to be efficient, with a return on equity of 14% and a return on assets of 2.5%. This indicates the competence of company management, and their ability to deliver returns to shareholders. Considering AerCap’s extremely cheap valuation, it is quite impressive that the company is profitable and growing earnings at such a high rate. That is truly a rare combination within today’s expensive market. 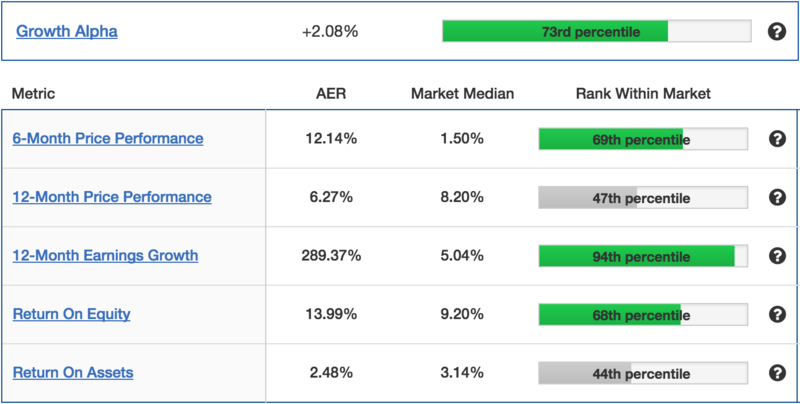 Our algorithms rank AerCap’s growth profile in the 73rd percentile of all stocks in the market (i.e better than 73% of stocks). Our algorithms expect its relative growth profile to contribute 2.08% of alpha moving forward. This means that, holding everything else equal to zero, we would expect AerCap to outperform the market by 2.08% over next twelve months just based on its growth profile. Company insiders have essentially maintained their positions in the stock recently, which is actually a positive sign in an environment in which company insiders are dumping stocks across the market. Short interest remains near the averages of the stock market at 4.4% of the float, reflecting mild conviction on the part of short sellers. 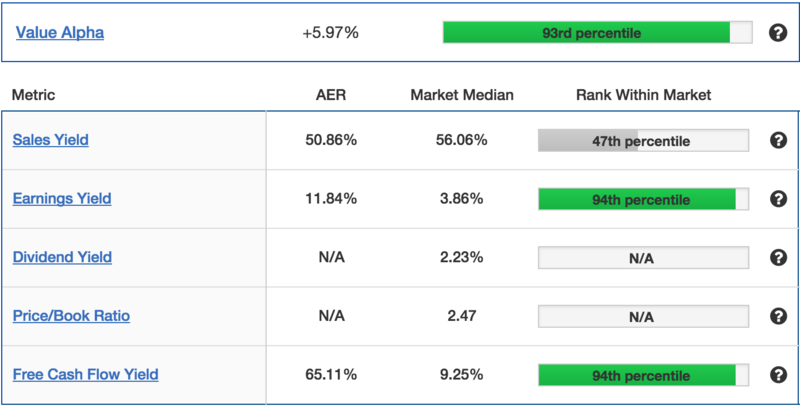 Our algorithms rank AerCap’s sentiment profile in the 96th percentile of all stocks in the market (i.e top 4%). Our algorithms expect its sentiment profile to contribute 5.64% of alpha moving forward. This means that, holding everything else equal to zero, we would expect AerCap to outperform the market by 5.64% over next twelve months just based on the current bullishness of the ‘smart money’ investors. AerCap beat last quarter’s Wall Street consensus EPS estimates by 12.5%, extending its streak of EPS beats to five quarters in a row and nine beats in the last ten quarters. AerCap also beat the consensus revenue estimates by 3.1%, which was its 4th quarter in a row that it beat revenue expectations and seventh beat in the last ten. There is a clear history of AerCap beating the expectations of sell-side analysts. This is important, as we’ve found through extensive historical back testing that companies that beat analyst estimates are far more likely to beat expectations the following quarter. Sell-side analysts currently project EPS of $1.33 and revenue of $1.28 billion for AerCap this quarter. Our model projects a 65-75% probability that AerCap will beat these estimates, with an expected beat size of 5-10%. Our model also projects a 55-65% probability that AerCap will beat the revenue consensus, with an expected beat size of 0-5%. AerCap releases its results next Tuesday, before the market open. On our base case, the Quantified Alpha algorithms expect AerCap to rise from its current price of $46.75 to a price of $57.73 over the next twelve months. This represents upside of 23.5% from current prices. 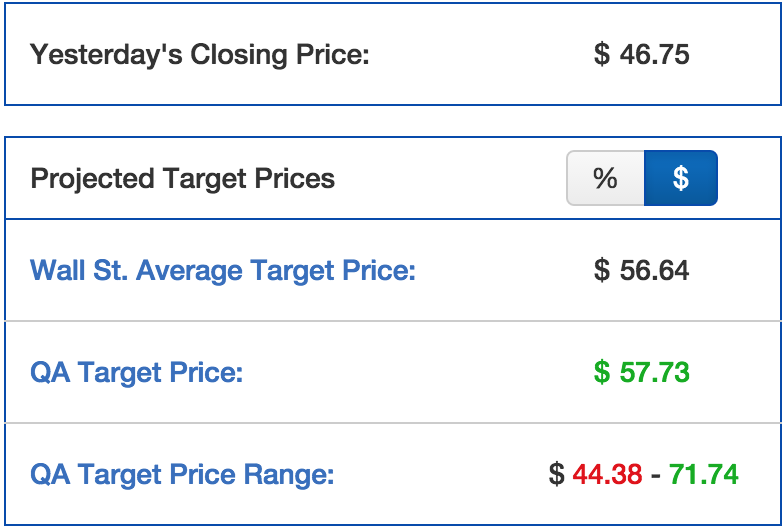 Our algorithms project a 75% probability that AerCap’s stock price will be between $44.38 to $71.74 in 12 months. 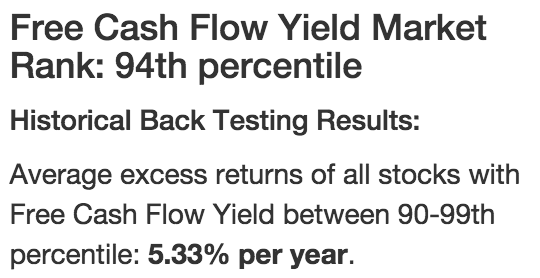 This ranges from potential downside of -5.8% to potential upside of +53.5%. The current risk-reward is clearly heavily skewed to the upside. These are slightly more optimistic projections than Wall Street analysts, who currently have an average 12-month price target of $56.64 (representing upside of 21% from current prices). AerCap is an ace in the hole. The stock is extremely cheap, growing earnings, profitable, and beginning to get recognition from the market. The stock is has been seeing heavy accumulation from institutional investors, who clearly share our enthusiasm in its prospects. Lastly, the company is beating analyst expectations each quarter, which is a trend that is likely to continue in the future. For once, we agree with analysts and predict that AerCap will significantly outperform the overall stock market over the following 12 months. Expect 23.5% upside from current prices.